Loacker, the premium wafer and confectioner, is celebrating this Season of Giving by supporting No Kid Hungry! 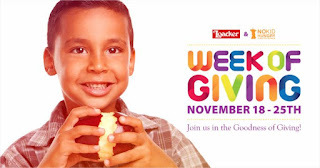 The Loacker #WeekOfGiving offers you a chance to win Loacker treats while raising funds for No Kid Hungry, a global cause to end world hunger. The holiday season is a time of giving and I hope you’ll join me and Loacker in fighting to end child hunger with No Kid Hungry. Together, we can help children get the food they need. How to Participate for Your Chance to Win! Post a video or picture of yourself conducting a charitable act or making a donation to No Kid Hungry on Facebook, Twitter or Instagram any day from November 18 to 25. Charitable acts may include volunteering at a local food drive, school or place of worship. In your post, use the hashtags #LoackerLove and #WeekOfGiving to enter for a chance to win. The first 100 verified charitable participants (using the hashtags) will receive a Loacker Insider box filled with Loacker treats. All verified participants will be entered into a random drawing where 10 winners will receive a Special Loacker SWAG BAG full of Loacker swag and tasty treats in time for the Holidays. NO PURCHASE NECESSARY. Ends 11/25/17 at 11:59 p.m. PST. Open to legal residents of the continental United States of America, DC, Puerto Rico and Hawaii. Prizes will only ship to the aforementioned locations. No P.O. Box addresses accepted. You must be 18 + or age of majority at time of entry to win. Limit one winner per household. This contest and drawing are wholly run and operated by Loacker USA Inc. Loacker USA Inc. is a partner of Share Our Strength, a non-profit 501(c)3 organization. Any donations made will go towards Share Our strengths and their “No Kid Hungry” initiative. Visit www.loackerlove.com for more info.